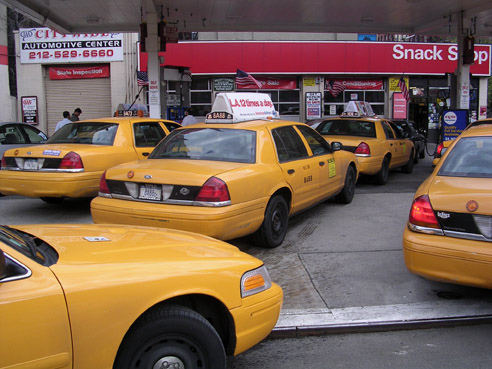 Need a Cab in NYC? Use Weeels! With Weeels, you can reduce personal fuel consumption - and save money! - by finding people to share your ride. Photo via digital_freak. Nope, it’s not a typo! We’re talkin’ about Weeels, a new online tool to help you “save time, save money, save energy and save space” by finding people to share a cab with you. Here’s how it works: First, you download the app for your smartphone (for now, it’s only compatible with iPhone, but a Web app and apps for other phones are coming soon); then, tell your phone where you are going, press a button, and search for other people near you who are going in the same direction. Whether you find potential cab-sharers or not, Weeels automatically calls you a livery cab (yellow cab version coming soon), and your phone shows exactly how much the cab will charge – a premium, pre-negotiated rate – to take you to your destination. Weeels is working to create a more efficient, affordable and friendly mode of transportation in areas of the city where cabs can be hard to find and public transit is lacking (particularly as public transit faces further cuts). Check out their fun little infomercial! For now, Weeels works best in Brooklyn and lower Manhattan, but it’s expanding and even plans to incorporate other cities. A full launch is planned for the end of the month. As we’ve written about before, smartphone apps have revolutionized sustainable urban mobility, including ridesharing. Taxicabs, especially, are going mainstream, with apps like CabSense that use real-time GPS data to help users find the best place to catch a cab. As this interactive graphic shows, taxi flow really reveals the pulse of a city. Way to go, Weeels.